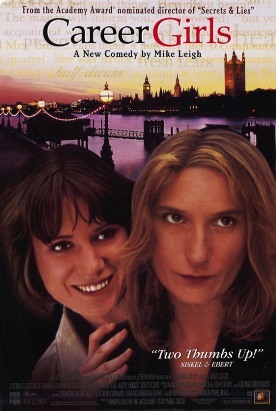 Career Girls provides evidence that Mike Leigh has been spoiled by success. Or by something. Anyway, he is spoiled. Perhaps it is because he has mellowed politically. This film only has one gratuitous swipe at Margaret Thatcher, and even that seems half-hearted at best. He was better when he was a fulminating leftie. At least the political passion gave his movies some direction, some point to which all the brilliantly assembled materials were tending. Since Naked, however, he seems to have lost his way. The materials are still brilliantly assembled, the eye for character and gesture and the moment when an ordinary event becomes pregnant with emotional significance are as sharp as ever. But now he doesn’t seem to know what to do with them all anymore. Even Secrets and Lies suffered from this directionlessness. That’s why he had to resort to letting Timothy Spall do an imitation of Rodney (Can’t we all just get along?) King at the climax. He didn’t know how else to get out of the situation he’d got himself into. As in those two last films, too, the plot of Career Girls is rudimentary to non-existent. Annie (Lynda Steadman) and Hannah (Katrin Cartlidge) shared a flat when both were students at North London Polytechnic in the 1980s. In the six years since their ménage broke up, Annie has been living in Wakefield, in the north, while Hannah has continued living in London, but both have been working in the new corporate Britain and gradually transforming themselves from grungy students into yuppies. Now, for the first time since they went their separate ways, Annie has come south to London to visit Hannah. They spend a weekend together, there are numerous flashbacks to events of their student days, and Annie goes back home. That’s it. Actually, the best thing about the film, apart from occasional flashes of characterization and dialogue, is the way in which Leigh manages to make these two young women stand for a kind of transition in Britain itself. In a way it is the same transition, from grungy, edgy, political life on society’s margins, to the sleek and prosperous EuroBritain that people like Mike Leigh fought every step of the way through the seventies and eighties. Now he must look back and, like his two heroines, find it difficult to wish himself back in those days at the same time he is nostalgic for them. Leigh has a talent for the Dickensian grotesque which cries out for a moral purpose. Without it, the grotesque in this film is merely weird. Most of it is centered in the character of Ricky (Mark Benton), whose full name is Richard Burton because his mum fancied the actor. “I don’t look like him,” Ricky explains, sublimely unconscious of the lack of any necessity to point this out. He is fat and awkward and has few social graces. Moreover, he has a kind of nervous tic and a speech impediment that is painful to listen to. In his first appearance, we see him talking about psychology with Annie and Hannah, giving away a dream of Annie’s that she considers private and quizzing the two girls on their “cardinal traits.” His own, he says is honesty. Hannah lays claim to generosity but then slams into him for his shallow psychoanalyzing. “She’s not very happy,” he says mournfully as Hannah walks out on him and Annie, a fellow psychologist. Later he manages to stammer out to Annie that he fancies her. She lies and says that she is in love with someone else. He goes out never to return. The two girls look him up at his home in Hartlepool, but he tells them to get lost. Six years later, they find him sitting on the step of the Chinese restaurant they used to frequent, possibly drunk or drugged but even more disoriented than he was as a student. “I’m not an idiot,” he tells them. “I’m an idiot savant. I just haven’t found my savant yet.” Again he tells them to “f*** off” because of their selfishness, and the fact they don’t care about anybody but themselves. For just a moment we are tempted to see this as Leigh’s moral: from being authentic characters, on account of their social marginality, they have become just two more among 1990s London’s army of yuppies. But it is a single moment. Ricky would have to stand more unambiguously for something they had lost or left behind and even he, down and out though he may be, is now wearing a suit. Besides, the whole tendency of the rest of the film is to encourage us to indulge our sympathy for the two girls’ reminiscences and our enjoyment of their reunion. Part of what he is doing is analyzing their friendship, which is based on the complementary nature of their two characters. In a flashback, we see the moment when the two girls find that both their fathers left their mothers when they were 8 years old. “Synchronicity,” says Hannah. But Hannah says she hasn’t cried since, whereas Annie hasn’t stopped crying. Hannah says wonderingly that Annie and her mother are more like sisters. “I depend too much on my mum,” says Annie. “My mum depends too much on me,” says Hannah. In fact, she hates her mother, an alcoholic, partly because her mother favors her sister, Francesca (neither mother or sister ever appears), even though it is she, Hannah, who has always done all the work of looking after her. When Annie makes a sympathetic noise (in the present), Hannah says, the fact only just dawning on her, that “You’re the only person I know that really appreciates me.” This insight comes at their dinner out on Annie’s last night in London. And another follows. “I admire your innocence,” says Hannah. It is a fine moment of understanding following on from a number of poignant memories that the weekend more or less accidentally re-awakens, but, once again, Leigh doesn’t really know what to do with them. Hannah puts Annie on her train back to the North and they engage once more in a schoolgirl game involving wishful thinking about “the man of my dreams.” The absence of any stronger resolution leaves us wondering, moving as the film has been in several passages, what it has all been for.